The final title I believe, was AFRICA SHAKES, although a title perenially under consideration was SHAKIN' UP AFRICA. It was basically us wandering around the veldt, running away from animals and stuff. Lots of music to fill the non-existent story line. It was Basil (Maier) who later reminded me that it started out as a promotional project , but ballooned into a feature. He and our manager, Frank Fenter, wrote the screenplay as they went along. The plot had a lot of holes to fill and I think our whole repertoire was used to take care of that. The film was released in South Africa and apparently in Gemany too. People I knew saw the movie and told me that it was very entertaining, but I have never seen it myself. 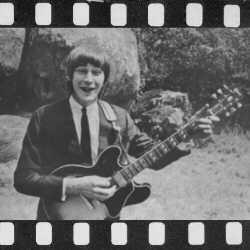 Brian Poole and the Tremeloes showed up on the "Africa Shakes" set one day, did their thing, and left. "Hello" was about all the contact we had with them. Sharon Tandy (simply known as Sharon in those days) was in it, too.